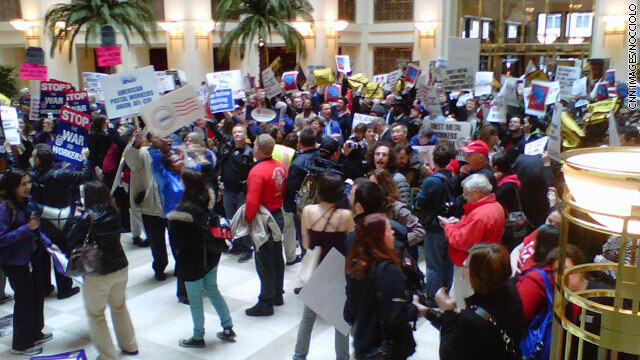 Pro-union protesters demonstrate at a Washington, D.C. fundraiser for Wisconsin Republicans. So, what public sector jobs aren't being performed while they demostrate? Your taxes at work. The Koch brothers just keep writing checks for republicans to attack the middle class. The republicans are the most divisive group in history. They have gone after: constitutional rights of Americans, seniors, veterans, hispanics, poor people, unemployed, uninsured Americans, teachers, policemen, firemen, nurses, and women's rights. They have made their main agenda tax cuts for the wealthy, tax breaks for big oil, tax breaks for Wall Street, deregulation of the health insurance industry, and repealing any laws that will help keep Americans safe. Vote for anyone but a republican in 2012. Republican leaders meet behind closed doors with the Kochs in California, and are now are fundraising with billionaires for the fascist republican criminals in Wisconsin. Unions disgust me. I will vote against any candidate supported by these thugs. Have you ever seen a group of people – unions – that have so much free time to inconvenience people and harm small businesses? Any sympathy I had for these jerks are gone. Stop bothering people who are just trying to get home to their children. Just what we need is another union funded demonstration. Sorry, the country just isnt buying the drama. Try Hollywood, they'll buy anything. the once sleeping giant has been awaken, just in time for the 2012 elections. Thank you Gov. Walker. As an old saying goes.."You don't know who you messing with"
pay attention repiblicans we are moving toward being like eygpt! eygpt has high unemployment and low wages which cause their problems not the need to be free! WI and other states are getting drowned out by the disaster in Japan but America still TICKS!!!! I hope WI is still getting signatures and the other states are still fighting!! I guess the next time we hear from these states – once the Japan news die down – senators and possibly a governor from WI will be RECALLED!!! You see an awful lot of unionists protesting from state to state all the time. Dont they have jobs they are supposed to be doing? Oh yeah their lucrative benefit packages paid by the taxpayers give them plenty of time off. Pretty soon everybody will realize these Republicans do NOT have the best interests of America at heart – only the best interests of the rich and corporate. While Arizona is a right to work state, I support these folks. Every time a Conservative says that Unions are hurting the tax payers, I just wonder who's buying this line of BS. Union workers (teachers, firemen/women, police, service workers) these ARE the taxpayers in America. Whether anyone wants to admit it or not, Unions are what created the middle class in America. If the neo-cons successfully eliminate Unions, they will in turn eliminate the middle class, which is the only thing that seperates the U.S. from non-democratic countries. Extreme capitalists can take the country to the same place as Russia of the 1980's, with the wealthy minority in control of the country and exerting their power over the working class poor. Thank you Republicans. Not for busting the unions, but through that you united the Democratic base overnight. Let me be clear, your victory last week will lead to scores of electoral defeats in 2012. TAKE AMERICA BACK FROM THE REPUBLICANS!! I want to go to DC and carry a sign around Public Union members that says, "Stop the War on Taxpayers". Need more of these stories! Let the fun begin. More peaceful anti rethug protests should be happening all around the country. The rethugs are NOT the party of the middle class and poor. Let's show them we are not listening to their BS any longer. Winconsin should have a recall of all their rethug politicians! Don't wait until 2012 or beyond.